Historical fiction is a tricky thing. Quite often, people confuse it as real history (see: 300). They don't seem to understand the difference between 'based on a true story' and a completely true story. 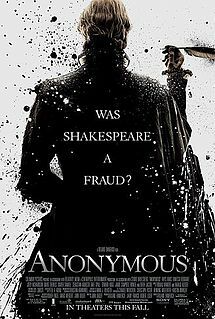 So I'm sure plenty of people will walk away from this movie believing that Shakespeare is a credit-hogging fraud. It can't be helped, I suppose. That said, this movie is highly, highly interesting. The story is so creative (what else would you expect from conspiracy theorists?) and the drama level runs so high throughout that you feel like you need a deep breath when the credits finally roll. I don't know what it is about the British, but they know how to put together a historical movie (both fiction and non-fiction)!! Do I wish the people cast in the movie had been more attractive? Of course. But with the exception of Jude Law, you just need to sort of accept that movies starring British men are going to contain some wonky teeth and harshly angular features. But it's one of those things where the acting is so good you can overcome it. Sort of like how people with 'good personalities' can still get dates. Final word: Provided you don't hate Shakespeare from years of being forced to read it in school, this is a must see.